This gorgeous unisex necklace is hand-crafted by the gemstones jewelry artisans. 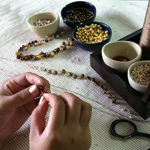 The master artisans combine smoky quartz, pyrite and brass beads. Features a silver lobster claw clasp. Materials: Smoky quartz, pyrite, brass and sterling (.925) silver.